Definition at line 95 of file msipriv.h. Definition at line 100 of file msipriv.h. Referenced by MSI_OpenDatabaseW(), and read_table_from_storage(). Definition at line 102 of file msipriv.h. Referenced by MSI_CloseDatabase(), MSI_OpenDatabaseW(), and MsiDatabaseCommit(). Definition at line 97 of file msipriv.h. Referenced by CREATE_CreateView(), CREATE_delete(), DISTINCT_CreateView(), DISTINCT_delete(), get_local_package(), INSERT_CreateView(), INSERT_delete(), MSI_ApplicablePatchW(), msi_apply_patch_package(), msi_apply_registered_patch(), MSI_CreatePackage(), MSI_DatabaseOpenViewW(), MSI_OpenDatabaseW(), MSI_OpenPackageW(), msi_publish_product_properties(), MsiDatabaseApplyTransformW(), MsiDatabaseCommit(), MsiDatabaseExportW(), MsiDatabaseGetPrimaryKeysW(), MsiDatabaseImportW(), MsiDatabaseIsTablePersistentW(), MsiDatabaseMergeW(), MsiDatabaseOpenViewW(), MsiEnableUIPreview(), MsiGetActiveDatabase(), MsiGetDatabaseState(), MsiGetSummaryInformationW(), MsiOpenDatabaseW(), UPDATE_CreateView(), UPDATE_delete(), WHERE_CreateView(), and WHERE_delete(). Definition at line 106 of file msipriv.h. Referenced by MSI_OpenDatabaseW(), and patch_add_media(). Definition at line 105 of file msipriv.h. Referenced by MSI_OpenDatabaseW(), and patch_set_offsets(). Definition at line 104 of file msipriv.h. Referenced by MSI_OpenDatabaseW(), MsiDatabaseCommit(), and MsiGetDatabaseState(). Definition at line 110 of file msipriv.h. Referenced by append_stream(), find_stream(), free_streams(), load_streams(), msi_commit_streams(), STREAMS_delete_row(), STREAMS_fetch_int(), STREAMS_fetch_stream(), STREAMS_find_matching_rows(), streams_find_row(), STREAMS_get_dimensions(), STREAMS_insert_row(), and STREAMS_set_row(). Definition at line 111 of file msipriv.h. Definition at line 101 of file msipriv.h. Referenced by ACTION_ResolveSource(), MSI_CloseDatabase(), MSI_CreatePackage(), MSI_OpenDatabaseW(), MSI_OpenPackageW(), and msi_set_original_database_property(). Definition at line 98 of file msipriv.h. 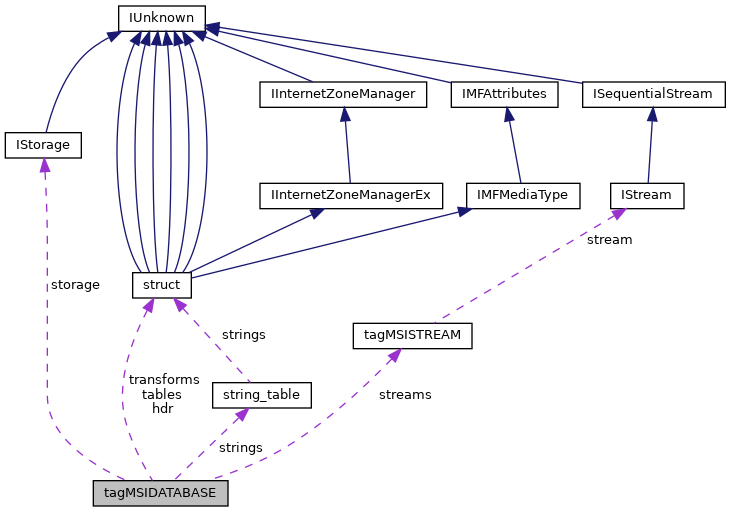 Referenced by add_storages_to_table(), apply_substorage_transform(), cabinet_open_stream(), get_package_code(), get_table(), load_streams(), msi_add_suminfo(), MSI_ApplicablePatchW(), msi_apply_patch_db(), msi_apply_patch_package(), msi_apply_registered_patch(), MSI_CloseDatabase(), msi_commit_streams(), MSI_CommitTables(), msi_export_suminfo(), msi_get_db_suminfo(), msi_load_admin_properties(), msi_load_suminfo_properties(), MSI_OpenDatabaseW(), MSI_OpenPackageW(), MsiEnumComponentCostsW(), MsiGetSummaryInformationW(), open_stream(), save_table(), STORAGES_set_row(), and STREAMS_delete_row(). Definition at line 109 of file msipriv.h. Referenced by append_stream(), find_stream(), free_streams(), msi_commit_streams(), STREAMS_delete_row(), STREAMS_fetch_int(), STREAMS_fetch_stream(), STREAMS_find_matching_rows(), STREAMS_insert_row(), streams_resize_table(), and STREAMS_set_row(). Definition at line 99 of file msipriv.h. Referenced by ACTION_ExecuteAction(), append_stream(), create_storage(), find_stream(), get_stream_name(), get_table_value_from_record(), get_tablecolumns(), join_find_row(), MSI_CloseDatabase(), msi_commit_streams(), MSI_CommitTables(), msi_create_table(), MSI_DatabaseExport(), MSI_DatabaseImport(), MSI_OpenDatabaseW(), MSI_OpenPackageW(), msi_record_to_row(), msi_view_get_row(), storages_find_row(), STREAMS_delete_row(), streams_find_row(), STREAMS_set_row(), STRING_evaluate(), TABLE_Exists(), and TABLE_set_row(). Definition at line 107 of file msipriv.h. Referenced by find_cached_table(), free_cached_tables(), get_table(), MSI_CommitTables(), msi_create_table(), and MSI_OpenDatabaseW(). Definition at line 103 of file msipriv.h. Referenced by create_temp_dir(), MSI_CloseDatabase(), and msi_create_temp_file(). Definition at line 108 of file msipriv.h. Referenced by append_storage_to_db(), free_transforms(), MSI_OpenDatabaseW(), and open_stream().